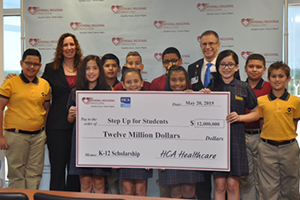 MIAMI, FL – The fifth-grade class from Kingdom Academy School in Kendall studied health outside of a traditional classroom today during a field trip to Kendall Regional Medical Center, which was sponsored by HCA Healthcare and the Step Up For Students Scholarship Program. Step Up For Students is a nonprofit organization responsible for helping administer the Florida Tax Credit Scholarship Program. The scholarship program is available to students who qualify for free- or reduced-price school lunch program, and students who are in foster care or who are homeless. It provides tuition assistance to the private school of their parents’ choice or transportation help to an out-of-district public school. Scholarships are funded by corporations that receive a dollar-for-dollar tax credit for their contributions. Step Up For Students also helps administer state-funded Personal Learning Scholarship Accounts (PLSA) for Florida students with special needs. With the PLSA’s, recipients may use the funds for a variety of educational-related services including tuition, part-time private tutoring, occupational therapy, instructional materials and other services.